So I’ve blogged a lot about Louisiana food, but I’ve rarely blogged about something that, in my mind, I have pegged as Utah food. I don’t know exactly why that is–maybe Louisiana food is just more new to me or maybe I feel like we have such a strong Utah-based readership that people won’t care about my Utah-in-my-brain recipes. Heck, I don’t even know what constitutes Utah food, but for some reason, in my mind, this salad just has “Beehive State” written all over it. I haven’t made this salad for a long time–I’ve been distracted with things like Sara’s Asian Wonton Salad and Chipotle Chicken Taco Salad. But remember when Sara talked about taking a bite of Black Bean Soup and being whooshed back to Brazil? That’s exactly how I felt when I took a bite of this salad. I was immediately transported a few years and 2000 miles back to the apartment my husband and I lived in for three years while he finished school, the one where we brought both our kids home from the hospital, the one where my cooking obsession kind of exploded. Doesn’t get much better than that, right? Combine all ingredients except dressing in a large bowl. When ready to serve, toss with desired amount of salad dressing and serve immediately. If you anticipate leftovers, just let your eaters dress their own salads because the dressing will make the greens wilt. The salad looks delish Kate- that's one of my favorite combos, can't wait to make it! Yummy. If wish I had all the ingredients to make this a breakfast salad since it is only 8:15am here in Portland. Can't wait for my next potluck invite because I will be bringing this salad. I make a similar salad, but add teryaki chicken off the BBQ ….mmmmmm,mmmm, good! Oh, I FOR SURE see Utah in this salad. I lived there for about 5 years and this kind of recipe was a standard piece of yumminess. I would put it down right in between the Frog Eye Salad and the Layered Cool Whip & Chocolate Pudding Dessert on the buffet table! I agree, it is Utah area. Now that we don't live there I forget about that kind of stuff for a bit, but come back to it. People here are so amazed that Jello can be used in so many ways and ask for the recipies, lol. Thanks for bringing it home! This recipe looked so great I ran out & bought the ingredients we didn't have on hand and shuffled our dinner menus to make it last night. It was yummy! We tossed everything but the bacon together and let the carnivores add their own bacon (or eat just bacon, in the case of certain four year olds). Oh yum. We are very into salads these days. We'll be trying this one! I made this salad for a Mothers Day luncheon at church a couple of days ago. I made two batches and we ran out. I would say if you are making it for a lot of people, my two batches were enough for about 40 women. I didn't get any, didn't even taste it after I made it because I was so busy running around getting set up for the ladies in RS. So, tonight, two days later, I made it for my family so that I could taste it. UNBELIEVABLE salad. I loved the fresh dressing. I saw this same salad with chicken and nuts using basically the same dressing too. You could be versitle with it. My niece & I tried this salad today for lunch and it was yummy!! We changed it around a bit by adding fresh strawberries, leaving the cheese off & adding sesame seeds to the dressing instead of poppy seeds, but was it ever good. Wewill definitely be having it again! I made this for a salad potluck and was so glad! 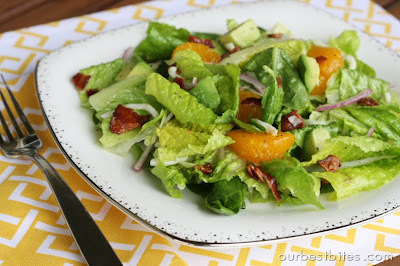 Yes, like most salads, you could subsitute the mandarin oranges for strawberries or craisins or add nuts instead of the bacon, but this combinations of ingredients was really, reeeeeally good. I'm going to be sure to stick with this combo every time. DELISH! Just found your blog last week and I LOVE it! I made this salad tonight–it’s a new favorite!! Delicious! This was the most amazing salad ever! Made it for a friend’s “girl’s night” without testing it first (as I do trust everything on this site to be fantastic 🙂 and it was a big hit! 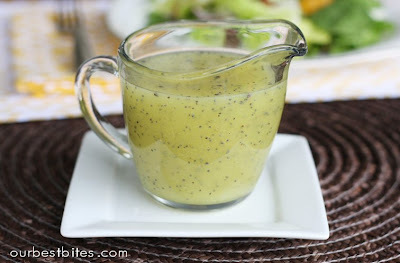 Everyone was so impressed that the dressing was homemade, but it was quite obvious as the flavour you could never get from store bought. The only downfall was the amount of bacon I ate while I was getting things put together … and I NEVER eat bacon :). Made this for a baby shower today and EVERYONE was asking for the recipe! Definitely a keeper! That dressing?! OH. MY. YUM. I could drink that stuff! This was the first time I had ever made this salad, but as others have mentioned nothing on your site is bad so I knew it would be delicious! I made this for a family bbq last weekend and everyone loved it. I sent at least 4 people to your website for the recipe. I will definitely be making this again. Thanks for another yummy recipe! I can always trust your recipes to be amazing! This salad never fails. I always leave with an empty bowl. Thanks for posting such a great recipe. We LOVE it!! Next Post ❯ Next post: Tutorial: Valentine Sugar Cookie Pops!